The 88mm Flak 36 Gun was powerful enough to penetrate the armor of Allied tanks such as the Matilda, leading to its effective use as an anti-tank weapon in North Africa. Tamiyas legendary flagship 1/35 scale model returns with newly designed figures in tropical Africa Corps uniforms. 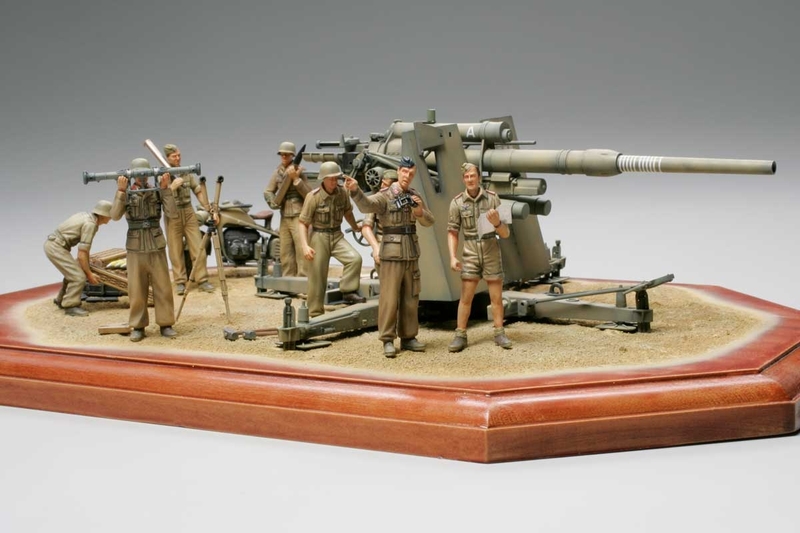 This kit is great for building dioramas involving Rommels men in the North African campaign. Flak 36 anti-aircraft guns made their notorious debut in an anti-tank role at Halfaya during the Battle of Sollum (Operation Battleaxe), June 1941. Firing from concealed positions at short range, they destroyed 123 out of 238 attacking British tanks. The Germans claimed one British tank for every 20 "88" rounds fired at Halfaya. Flak 36 guns serving in Africa performed in both anti-armor and anti-air roles, and were indeed the ace-in-the-hole of the Africa Corps. 1/35 scale assembly model kit of German 88mm Gun Flak 36 North African Campaign. Parts for Flak 36 gun have been molded in desert yellow color. Comes with realistically replicated ammunition cases, 2 types of projectiles and spent shells. Includes various accessories such as rangefinder, telescope, hammer and stakes. Comes with Zundapp KS750 motorcycle for even more diorama possibilities. Choice of three types of markings.